Though we usually thing of fences as being firmly rooted in the ground, there are plenty of applications for fences that are one, two, or 20 stories up. Rooftop fencing is essential for the security of those who work on and around high, open areas on tall buildings. Let’s discuss some applications of rooftop fencing for commercial use. Rooftop terraces on hotels and apartments are often places where big social events are held. In order to ensure the security of all patrons, rooftop fencing is a must. Helicopter pads on medical facilities allow for fast and easy transport of medivac units. Fencing on these units often extends out horizontally from the pad and utilizes a chain link safety net to protect against accidental falls. Angled rooftop fence can be used on any commercial structure to protect those who need to access the roof, for example, HVAC maintenance workers. Angled fences prevent climbing and ensure the safety of everyone on the roof. 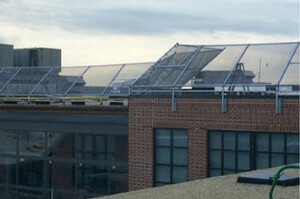 The roof of parking garages is often exposed to the air. Concrete provides the first barrier, but fences are often used to supplement this barrier and protect patrons of the garage. This entry was posted on Friday, July 25th, 2014 at 7:52 pm. Both comments and pings are currently closed.